Responding, the government said it "acknowledges the considerable number of people" who have signed it. But revoking Article 50 would "break the promises" made to voters, it said. 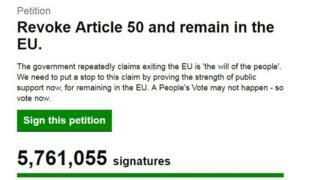 The petition on the UK Parliament's website - started by retired lecturer Margaret Georgiadou - calls on the government to revoke Article 50, the two-year process which is triggered when a country wants to leave the EU. Mrs Georgiadou, 77, responded to a date being set for the debate by calling for more signatures, adding: "The battle draws nigh again." On Tuesday, the Petitions Committee - which is in charge of considering the petitions submitted - announced that it has been scheduled to be debated in Westminster Hall at 16:30 GMT on Monday. 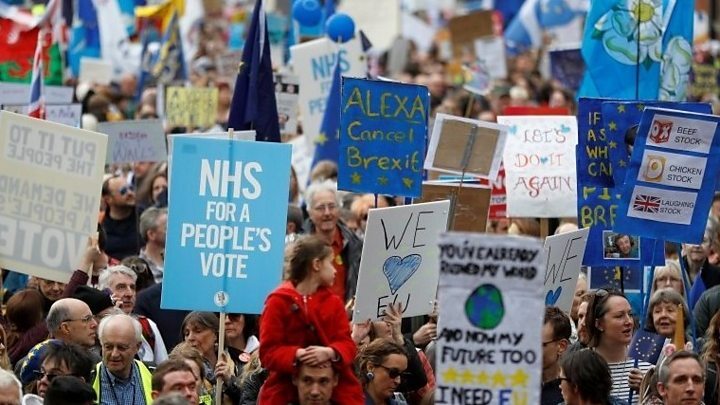 The committee said it decided to combine the three petitions into one single debate to ensure they were debated as soon as possible, "so they would be less likely to be overtaken by events". The UK had been due to leave the EU on Friday, but both sides have agreed to postpone Brexit until a later date to give the UK more time to either approve Prime Minister Theresa May's Brexit withdrawal deal or decide its next steps. Mrs May's deal - which she negotiated with the EU - has been rejected twice by Parliament. She is considering asking MPs to vote on it for a third time, in the hope that enough of them have changed their minds to get it passed. In its response to the petition, the government's Department for Exiting the European Union said: "This government will not revoke Article 50. The statement said cancelling Brexit and staying in the EU would "undermine both our democracy and the trust that millions of voters have placed in government. "The government acknowledges the considerable number of people who have signed this petition. "However, close to three quarters of the electorate took part in the 2016 referendum, trusting that the result would be respected... 17.4 million people then voted to leave the European Union, providing the biggest democratic mandate for any course of action ever directed at UK Government." It added: "Revoking Article 50 would break the promises made by government to the British people, disrespect the clear instruction from a democratic vote, and in turn, reduce confidence in our democracy." Mrs Georgiadou, who previously said she had received death threats for creating the petition, tweeted: "Show your mettle and go garner more votes!"